I had a much different blog planned for today, but… who knew Craigslist could be such an emotional roller coaster? 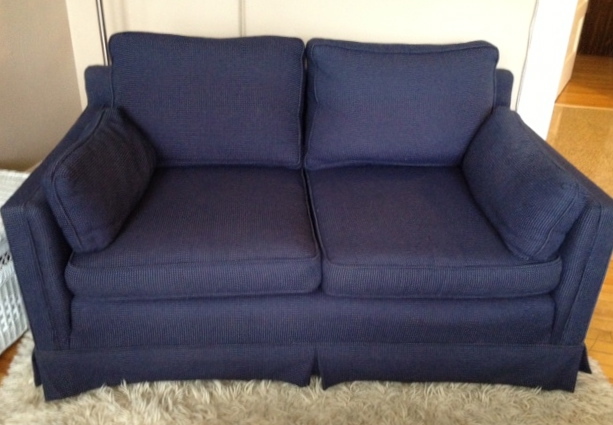 A couple of nights ago, I posted a listing for a free loveseat. “Cute, cozy and clean. It’s yours if you can pick it up.” I purchased it from a friend two years ago and fully enjoyed its endearing sag and the way the seat cushions inched their way forward as I lounged. But it was time for me to purge some belongings. Within 60 seconds of posting, I had six responses. Immediately overwhelmed, I deleted the posting and made a snap decision to give it to the first person who wrote in response. It seemed like the fairest thing to do (and I always appreciate fairness). So, after telling a complete stranger where I lived and when I could be home the next day, I took one last sit on my lovely loveseat and read the other emails. Most of them were hurried, a couple were incomprehensible and one was sort of scary (“IT’S MINE. WHERE ARE YOU.”). But the sixth email was sent by a woman named Maggie, who wrote an articulate and impassioned plea for the loveseat. She explained that she could give it a wonderful home in her new apartment and could pick it up anytime at all. She included full contact information and a grateful “thank you” for listing it at all. I felt a twinge of regret and wrote her back to tell her someone beat her to it, but that I would let her know if it fell through. She replied with a swift note of sincere appreciation and I promptly burst into tears. I really, really wanted to give her the loveseat. She seemed so deserving and trustworthy. But in haste, I had already promised it to Drew, who I was now imagining to be some kind of smarmy serial Craigslister who would either kidnap me, break into my apartment and take something valuable (my sewing machine? ), or sell my precious loveseat for profit in some kind of illicit loveseat-reselling industry. I calmed down enough to get ready for bed and begrudgingly agreed to meet Drew and his roommate at 11:45 a.m. the next day (at which time I gave my co-workers Post-It notes containing my address and a come-find-me-if-I-don’t-return-by-12:15 memo). I couldn’t shake the thought that I’d made the wrong decision, but I couldn’t ethically turn back. Drew and roommate were both somewhere around 21-years-old, reeked of smoke (“doobie” smoke, as I like to call it) and were polite but not logical. After spending 30-seconds watching them try to jam the couch through my doorway head-on, I gently suggested a sideways approach. “Cooool,” they said. While I watched them roll away with the loveseat precariously hanging out of the back of Drew’s truck, I gave the thought of Maggie’s empty apartment one last sigh. I’m comforted knowing that Drew and company are probably enjoying a smoke and a snack on its comfy cushions at this very moment, but I am also pretending I didn’t see one of the arm cushions lying on the side of the road two blocks away this morning. One day, I know I’ll wake up without a loveseat-care in my head. It’s just going to take some time. An amazing blog post!! So real! so emotional!! Haha… Thanks, Renee. It was a tough time. That was a very well written post and a pleasure to read.